We're very lucky to have so much beautiful landscape here in the South Wales Valleys, with it being hard to choose a hands down favourite, however Cwmcarn Forest is definitely one of my favourites. We've been visiting this forest since before moving to Wales four years ago now, and the beauty of it still amazes me with every visit. Located in the village of Cwmcarn, the forest plays host to Twmbarlwm mountain with its panoramic views (as seen in opening picture) as well as a seven mile forest drive. Currently, the forest drive isn't open due to the felling of infected trees however there is still plenty to see and do, especially for families. As you walk up to the area you'll be greeted by the building that is the visitor centre, as well as big sign that has an overview of the forest with some highlighted trails. Inside the visitor centre there is a little shop with knick knacks, the Raven Café, toilets and also maps, leaflets and guides regarding information for the forest itself as well as locally within the area. If you have a buggy or a wheelchair, there is access for these also. With having Alexander exploring now, we do keep lower down within the forest area, as his little legs can only take him so far, however with trails for varying abilities we are still able to enjoy the forest landscape. Prior to having Alexander, Nathan and I explored plenty within the area and have also climbed the mountain on more than one occasion. So whilst we tend to stick to the shorter trail now, wander at will, and spend time at the lake that commands your attention when walking up from the visitor centre (see below), there is much more to do including mountain biking, various indoor and outdoor events run throughout the year, and also the ability to camp onsite. Cwmcarn Forest has its very own campsite - you're able to stay in tents & caravans and they also have some glamping pods onsite too. With lots of little villages not too far from Cwmcarn, as well as other nature spots close by, this would make a great base for exploring the local area. As I mentioned above, the site does have a café: Raven Café. They have both a breakfast and lunch menu, with plenty of drinks and snacks on offer too. The food itself is reasonably priced and goes down well after a good old wander in the forest. If you're a non driver like us, Cwmcarn Forest is easily accessible by public transport and on foot. For drivers, there is plenty of parking space available at the visitor centre for a minimal fee. 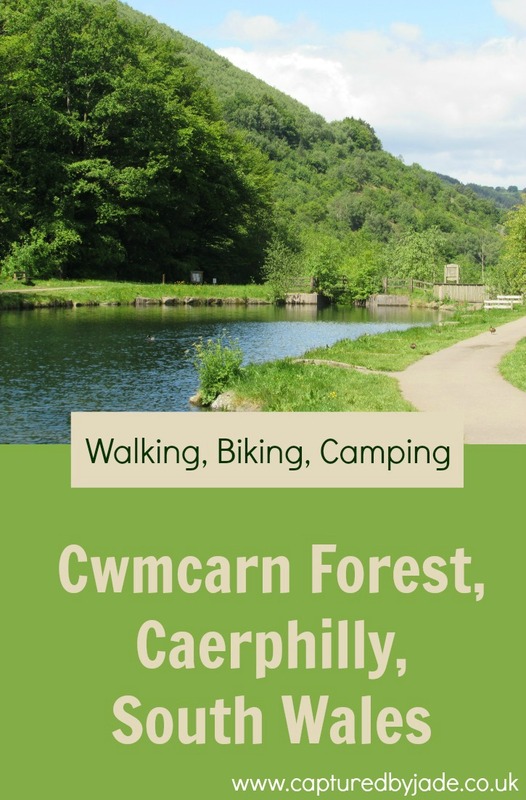 For more information, visit the Cwmcarn Forest website. ...Jade, this looks like my kind of place! It really is; so much to see and do! Yes - Cwmcarn Forest is definitely a great place to get lost in nature and truly immerse yourself in the forest, especially with being able to camp there. I hope you had a wonderful time when you explored the coast here; we've yet to do much of that ourselves. Ah, thank you! I hope you've been having a lovely weekend. Lots of beautiful landscape to be found in Wales.